The name Lace Wars derives from the struggle between rival monarchies (and a few rogue republics) for control of the lucrative texile industries of the Low Countries, Central Germany, and the Po Valley. Mechelin lace was a highly prized commodity and the fortress town of Mechelin (Malines), on the border between Belgium and Holland, changed hands many times over the course of the 17th and 18th Centuries. 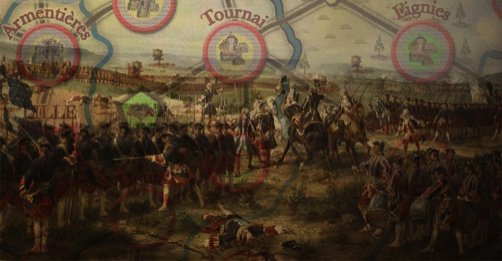 The intent of the Lace Wars games is to examine the conflicts of Europe from the late 17th to the middle of the 18th Century at an operational level. We've had some debate as to whether they should be called "games" or "operational studies". They are games, not pure history, with sufficient abstraction of detail to make them playable; at the same time you can't drink beer as you play and expect to win. Each of the games uses a set of standard rules called the King's Regulations and Orders. Rules exclusive to a particular game come in their own booklet. Armies are represented by die cut cardboard pieces and a game board or map based on period documents represents the 'area of operations'. Each game in the series looks at a particular theatre of war in a particular conflict. The games are thus at the 'operational' level. That is, the players are not national leaders, nor junior officers, but senior generals commanding all the forces fighting in a specfic region. Each game comes in one of two scales, Battalion or Brigade. This refers to the type of military unit the playing pieces represent. The orders of battle are as complete and detailed as research can make them and the pieces, which are cardboard counters, have artwork depicting the actual uniforms worn. The maps are also at one of two scales, one-league hexes or four-league hexes. (We have used the standard French league of 4 Km.) The maps have a grid of hexagons superimposed on them to regulate movement. A map scale of one league per hex means more detail but less area than the four-league maps. Each game has a set of minor scenarios, usually covering a single campaiging year, and one or more campaign games covering the whole affair or a large portion of it. Initiative - i.e., who currently has the 'edge'. The player with the Initiative determines who goes first and can dictate the pace of operations to some extent. Maneouvre. The games emphasize movement over combat. Battles are risky affairs and it is much better to 'lever' your opponent out of his position than attack him head on. Combat. The period covered by the series includes the golden age of siege warfare, so fighting includes both battles and sieges. In battle, troop quality and numbers are the key factors, as well as a good mix of unit types. In sieges the key factors are the strength of the fortification and the availability of siege guns and specialists such as sappers and engineers. Winning the game often requires the capture of a number of fortifications, so a typical scenario will see one player pushing away a covering force, blockading and then laying formal siege to a place, and deploying a second covering force to deal with any counterattack by the enemy. Battles will occur as one player tries to prevent a siege or relieve a beleaguered location. Supply. The period covered by the series saw a transition from living off the land to the use of extensive magazines and depots, to a return to living off the land. Both methods will be needed to supply armies on campaign. River and canal movement has been taken into account and will prove as critical to success as the use of rail lines in more modern games. Operational Tempo. Operations Ponts are used to represent the accumulation of resources, planning, and political will. The players have to choose whether to pause their efforts and collect these points or launch their offensive and expend them. Once out of points it becomes very difficult to accomplish anything, so another pause will be required. The players also have to balance the expenditure of operations points between building supply depots and carrying out other activities. Leadership. Leaders, some great and some not so great are represented in the game, as befitting an era where personal command was critical. They are rated in numerical terms for their overall capability but are also rated for Personality, which give them special benefits and penalties. Auxiliaries. Auxiliaries represent support troops and irregulars who had a major impact on operations. They include such things as light cavalry bands, engineers, bridging units, and even priests! A player might have a pontooneer auxiliary that he can play onto a stack to help it cross a major river, or a converged grenadier auxiliary that provides a morale bonus in combat. Prestige. The goal of the game is to acquire Prestige - and not necessarily to win the war! Since the players are usually theatre commanders they do not have full control over the outcome of the war. Instead, they are looking to improve their 'resumes' by accumulating Prestige points. These are awarded for things like winning battles and sieges. To read about and order the individual games, use the Lace Wars Series pull-down menu above. Historical information can be found under Resources.